Through Niagara Cares, Niagara Bottling is committed to supporting local and national charitable organizations and programs by engaging stakeholders, volunteering in the community and investing its resources to support vulnerable children and their families. The Niagara Cares® local non-profit grant program supports community initiatives related to children’s education, health and wellness in areas where our Niagara Bottling facilities are located. Deadlines for proposal submission each year are March 31 and September 30, with grants being awarded on June 15 and December 15. An organization must be within a 50 mile radius from a local Niagara plant and may only be awarded one grant per year. Niagara Cares also supports qualifying organizations through the donation of water bottle cases. In addition to providing bottled water for disaster relief around the globe, Niagara focuses on children and families in need and organizations whose mission is to support them. 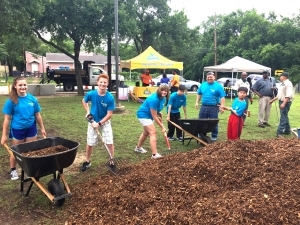 Our Team Members are continually improving their communities by giving back in a variety of ways. Whether it is as a group or as an individual, volunteering is a way of life for Niagara. 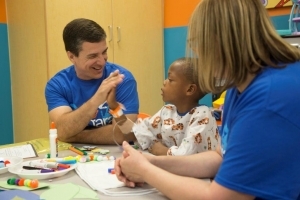 All Team Members are encouraged to support the charities and local organizations that are most important to them, especially those that serve children and families in need. Niagara Cares also matches funds raised by groups of Niagara Team Members who contribute to non-profit organizations in their local community that align with Niagara Cares’ mission. Below are a few example stories of our Team Members in the community. Team Members in Dallas got up early to cook and serve breakfast to 40 adults and children staying at the Ronald McDonald House. The Ronald McDonald House is located in the hospital district in Dallas close to the Children’s Hospital. They provide room and board free of charge to families with terminally or critically ill children requiring hospitalization for long periods. 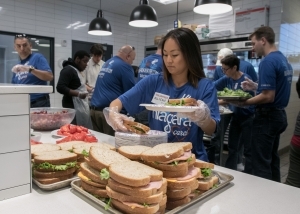 With Lunch Bunch City of Plainfield, our Team Members made 400 sandwiches for lunches that fed local children and their caregivers. Some of the Team Members had the privilege of serving the lunches at a local park where approximately 150 children and caregivers attended. Leftover lunches were taken to the homes of children who had no transportation to the park. Through Starlight Children’s Foundation, Niagara Cares donated $10,000 worth of toys and needed items to Maricopa Medical Center to support child life initiatives benefiting pediatric patients. In addition, Team Members also hosted arts and craft activities for children at the hospital and distributed care packages to the parents of patients. 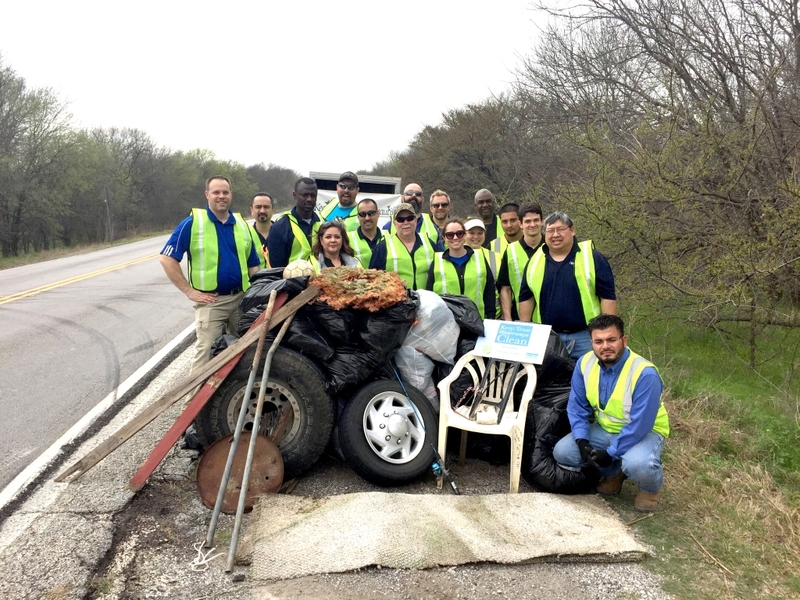 Our team in Dallas adopted a stream near our Niagara facility and in partnership with Adopt- A-Stream of Grand Prairie. They hosted a spring-cleaning volunteer activity and cleared out all the trash in the area. Over a thousand homeless teens are living on the streets of Utah and need support different than what is provided to adults. Volunteers of America had been working on a Youth Resource Center for five years and because of the power of the community, VOA was able to open the Center in spring of 2016. Niagara Cares was one of the main sponsors to fund the facility. Our Team Members continue their support by preparing and serving lunch to teen residents. 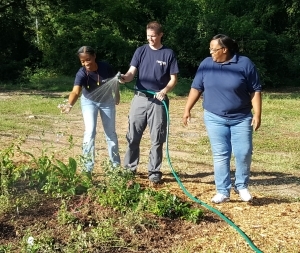 In partnership with Keep Newnan Beautiful and other community organizations, Niagara Team Members helped transform a city-owned lot to a pollinator garden. The garden is home to pollinating insects and animals and is used to educate local residents about the important role they play in the environment. Niagara made a donation towards the purchase of the drought resistant pollinating plants and have partnered with a local high school environmental club as well as a garden club to maintain and prune the garden. This is an ongoing partnership as the garden expands to include a recycle center, social garden space for the community, outdoor classroom space, butterfly and bat houses and a greenhouse made with recycled Niagara water bottles. 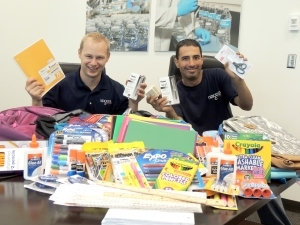 Team Members from across the company donated school supplies to various non-profit organization to provide children with the tools they need to succeed. Many of our plants held school supply drives encouraging Team Members to donate backpacks, pencils, notebooks and other essential items for academic success. Some volunteered in distribution events by helping sort and giveaway the items to children in need. Niagara Cares and the National Recreation and Park Association (NRPA) awarded a grant of nearly $70,000 to the City of Dallas which funded the installation of new playground equipment in Urbandale Park. Located in a residential community, the park had been without a playground for many years after it was burned-down by arsonist. Niagara Bottling Team Members helped complete the final touches of the playground by filling the play area with mulch and attaching the seats to the new swing set. The opening of the park was celebrated with a community barbecue, flag frisbee and ribbon cutting. Opportunities to play outdoors in community spaces like Urbandale Park are vital to encouraging physical activity and combating childhood obesity. 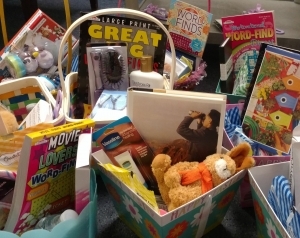 In partnership with the Salvation Army of Coweta County, Team Members donated Easter basket items including handkerchiefs, socks, tissue, lotion and large print books for 80 residents at Avalon Nursing Home in Newnan, GA. 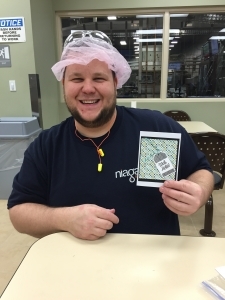 While on break, Team Members made cards with a personalized note inside for patients in hospice care at Leigh Valley Health Network in Allentown, PA. Lehigh Valley Health Network provides physical, social, spiritual and emotional care to individuals and their families. Our Team Members in Kenosha hosted a group of students to educate youth about the manufacturing industry and career opportunities. 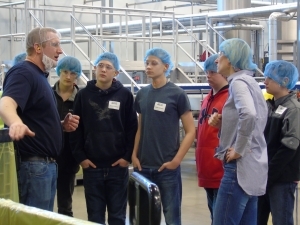 The event included discussions about the bottling process, career paths and the education required to succeed in today’s manufacturing environment.